In a recent review of Solaire's Explosives To My Body on this site, our very own Mac Nguyen noted that Explosions in the Sky were one of "this decade's most influential groups of the guitar driven post-rock aesthetic," and less than a week later I find myself reviewing an album by yet another band who owe a third-world country sized debt to the aforementioned apocalypse-predicting Texans. 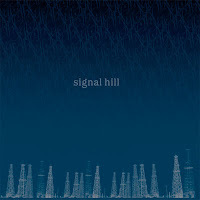 The first thing one notices when spinning Signal Hill's debut self-titled EP, is that the echoing, reverb-laden and spacious guitar sound would sit right at home on The Earth is Not A Cold Dead Place; the second is that the band has the ability to write some very lovely hooks indeed. Second track "Los Federales," for example, revolves around an extremely simple three note melody that lingers in the mind long after the track fades away, while "This New Years Absence" is built on a simple descending riff which the other instruments slowly bolster and swell around in a nice example of the staple quiet/loud aesthetic of much modern post-rock. This simplicity of purpose repeats across most of the EP as a whole, and is both a blessing and a curse; many of the melodies are infuriatingly catchy, yet across the course of six songs, they have a tendency to blur into one-another. In some areas of the instrumental scene, there has recently been something of a backlash against songs that constantly veer into double-digit track lengths, with bands no longer feeling the need to reach these lengths in order to achieve a feeling of the expansive and epic, and the closing track "California is Too Long" is a good example of this more focused approach. Split into two sections by a brief sample, the guitars begin by creeping over one-other, before one cribs (in part) the lead melody from Angelo Badalamenti'sTwin Peaks Theme and a few sweeps of a synth are heard. Following the brief spoken word sample, the track leads off and upwards with some tight, disciplined drumming, a few notes on a piano, and guitars that chime and ring in that melancholic yet uplifting manner that has seduced so many instrumental bands in the last few years. It's affecting stuff and, like most of the music found here, is proof that Signal Hill have the raw talent to write some great material.